The Blush Magnolia | a southern lifestyle blog: Some days you just need a milkshake. Some days you just need a milkshake. Nevermind that even though I got the junior size it was still a third of my caloric intake for the day. I'm currently stressing over my two huge final assignments for my class - the draft of one of these is due tomorrow at midnight. I feel like I might spontaneously combust from the stress of it. On days like today, I think I deserve a delicious 570 calorie treat. Some days you just need a milkshake. I am not planning to be on Say Yes to the Dress. I did apply to be on the show but have not heard back. That is not a determining factor in my dress shopping and I want to go to Kleinfeld's regardless for their amazing and extensive selection. But I do think it would be pretty cool! The van photo in my previous post was taken the day a utility van was parked across the street from the back yard of my condo. A good...30 yards away from my back door. It shifted out of gear, rolled down a hill, became airborne, and literally flew into the back of my townhouse. Everyone was ok and all of my stuff was fine. The townhouse had structural damage and the relaxing garden tub was shattered. I might do a post on this at some point! It was a pretty interesting and memorable day! 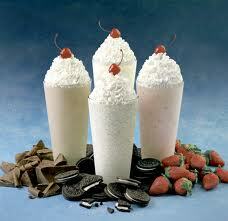 I could use a milkshake. I would say you definitely deserved a milkshake! Chick-fil-a ones are hands down the best. I had one of those days last week!